The 10 Best RV Trips To Take In South Carolina - Must See! Ah, the Carolinas. Their pleasant climate and beautiful beaches make them the ultimate vacation spot, any time of the year. Both states enjoy three distinct seasons with mild, usually snow-less winters. But though they may be alike in climate, these two states have quite a few differences, especially when it comes to road trip opportunities. South Carolina has more than 180 miles of Atlantic coastline, and much of the coastal plains are dotted with strange dents in the ground, known as Carolina Bays. Further west is Upcountry, where rocky outcroppings and rolling hills hint at what was once an ancient chain of mountains. The northwestern-most region of South Carolina is home to a slice of the majestic Blue Ridge Mountains and their dense, lush forests. Scenic drives and natural anomalies can be found in just about every region of the state. South Carolina has many cultural attractions as well. Museums and performing arts venues are common throughout the state, with its largest cities known for being artistic hubs. Exploring the Palmetto State is easy no matter what region you’re in, thanks to the abundance of RV dealers in South Carolina. In this article, we’ll show you the coolest spots to add to your must-see list. 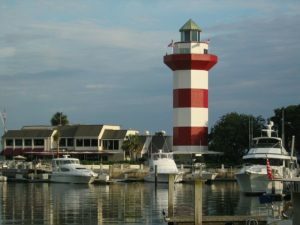 Hilton Head is easily one of South Carolina’s biggest tourist attractions. If you’re the type that appreciates the finer things in life – including a relaxing day on the beach or the golf course – you’ll fit right in at Hilton Head. For such a small island, it offers a surprisingly diverse array of culture. Gullah Geechee neighborhoods and Antebellum mansions reflect the island’s history, when thousands of freed slaves and soldiers made Hilton Head their home. The arts are important to Hilton Head residents – the island is home to a Symphony Orchestra and several performance arts groups. Festivals and events take place throughout the year. Notable stops include the Coastal Discovery Museum, The Sandbox Interactive Children’s Museum, and of course, the famous Harbor Town Lighthouse. Make sure you bring your appetite, too, because Hilton Head has more than 250 restaurants that serve everything from traditional southern dishes to exotic cuisine. The island has two options for RV camping, both of which are upscale. Hilton Head RV Resort and Marina offers amenities like a pool, watersports, and waterfront sites with full hookups starting at $79 per night. On the other side of the island is the Hilton Head Motorcoach Resort, where you’ll find sites along the private lake or in the woods. They’re a motorcoach-only park, so you’ll need a Class A, C, or Super B RV rental in South Carolina if you want to stay for the night. Rates start at $65 per night. Carowinds is one of the largest theme parks in the state. At nearly 400 acres, there’s definitely more than a day’s worth of entertainment here. There’s a vast collection of rides, from the Intimidator (one of the tallest coasters in North America) to a handful of gentle, family-friendly rides. 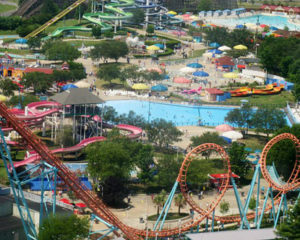 Your ticket also gives you access to the Carolina Harbor Waterpark, a new addition to the park that has dozens of ways to take a break from the South Carolina heat. Aside from rides, the park also has special events and seasonal offerings throughout the year. Scarowinds and Winterfest are off-season favorites, each with their own variety of holiday shows and activities. The year-round Dinosaurs Alive! experience, an exhibit of more than 50 animatronic dinosaurs, is fun for all ages. Make sure to check the website before you go to see what current events await you! Price: Varies by package. See site for details. Why not stay close to all the fun? Camp Wilderness is the park’s designated campground and it’s just a quick walk away from everything Carowinds has to offer. They offer full hookups and paved sites for RVs up to 40 feet long. Amenities include a game room, pool, and camp store. Rates vary from $48 to $77 per night; Good Sam members get a 10% discount. Congaree looks like the perfect place to film a movie about prehistoric animals. But it won’t happen because it’s a protected habitat for many modern ones. It’s the largest stretch of old growth hardwood forest in the United States. In other words, its trees are tall, and its ecosystems are complex. Many of the trees here are the tallest of their species, including a 167-foot loblolly pine, a 135-foot American elm, and a 127-foot persimmon. The forest occasionally floods, making it the perfect habitat for reptiles, amphibians, and fish. There are a ton of activities in this 26,000-acre park, the most popular of which are canoeing and kayaking. The Cedar Creek Canoe Trail is a 15-mile, self-guided tour through the park’s winding waterways. There are ranger tours as well, in case you’d prefer a bit of narration. 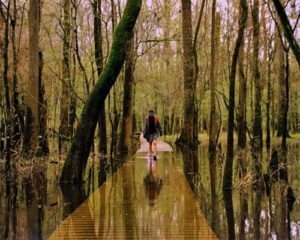 Hiking and fishing are also a few favorite activities in Congaree. RV camping is not allowed in the park, but nearby Poinsett State Park has plenty of RV spots! Standard sites come with water and electric hookups and free Wi-Fi. There’s a small lake with a swimming area and paddle boats. Most importantly, the park is quiet and clean. Rates are unlisted, but reviewers claim they’re very affordable. Greenville Zoo is a great option for a relaxing day trip with the kids. It’s a lovely little zoo that started out with just a few indigenous species but is now home to scores of animals from around the globe. Primates, big cats, giraffes, and red pandas are just a few of the many creatures you’ll find here. Exhibits are broken up into themes, such as the reptile house, the South American area, and the Asian Encounter exhibit. 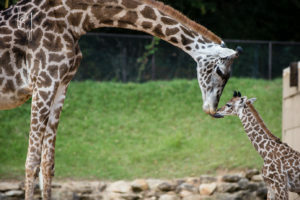 Greenville Zoo has an extensive list of kid-friendly activities and education, which sets it apart from many other zoos in the state. Tell Me About it Tuesdays is a free Q&A session with the zookeepers at various animal enclosures. On Thursdays, kids can learn about animals up-close at the Learning Safari. There’s also a Secret Safari – get your first clue online then visit the zoo to complete the puzzle and win a prize! Price: $9.75 for adults, $6.50 for kids ages 3-15, free for kids 2 and under. Discounts for military and seniors. Springwood RV Park is the closest campground to the city. Though mostly long-term residents, they do offer overnight camping with full hookups at select sites. Cable and Wi-Fi are optional. Rates start at $35 per night. There are many more options for camping just outside of Greenville. Check out this list of RV parking in South Carolina to find other nearby parks. Myrtle Beach is another popular vacation spot in South Carolina, though it has a much more “touristy” vibe than Hilton Head. It’s an enormous city situated right on South Carolina’s Grand Strand. There are dozens of neighborhoods throughout the city and along the strand, each offering their own appeal. Murrell’s Inlet is known for its gorgeous plantations and historic landmarks, as well its large maritime forest and Moorish castle. North Myrtle Beach has a laid-back, suburban vibe, with quiet beaches, shopping outlets, and an array of restaurants. Then there’s central Myrtle Beach – the heart of it all. Here, visitors can explore the boardwalk, go shopping downtown, go on rides at the Family Kingdom Amusement Park, peruse the Ripley’s Believe it or Not Odditorium, and so much more. 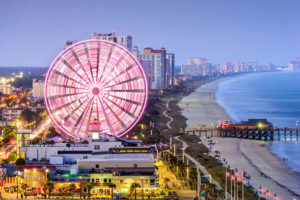 Whatever you do, though, don’t forget to ride the Myrtle Beach Skywheel, a whopping 200-foot observation wheel that towers over the Myrtle Beach Boardwalk. Price: $14 for adults, $9 for kids ages 3-11. VIP tickets are $50 and $35, respectively. Oh, there’s certainly no shortage of places to stay at Myrtle Beach – it’s all up to what experience you want. Do you want to be close to the action at the Myrtle Beach KOA? Do you want wooded lots and river-front golfing at the North Myrtle Beach RV Resort and Marina? Or would you prefer an unbeatable ocean view and a bevy of activities and amenities at the Ocean Lakes Family Campground? The choice is yours. 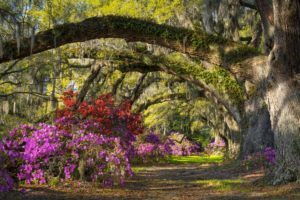 Charleston County is known for its historic plantation houses, and Magnolia Plantation & Gardens is perhaps one of its best examples. Located along the banks of the Ashley River, this charming plantation is one of the oldest in the country. It was built by Thomas and Ann Drayton in 1676, and at the time, included a small formal garden on the grounds. In the 1800’s, Thomas and Ann’s grandson inherited the plantation and began making changes to the garden – it’s thought that he may have brought the first Azaleas to America. He worked hard on expanding the gardens, and in 1870, opened them to the public. Today, Magnolia Plantation & Gardens has dozens of themed gardens and attractions. The family’s prized plants, Azaleas and Camellias, can be found throughout the grounds, in addition to hundreds of other plant species. Popular attractions include the Swamp Garden, the Rice Field Boat Tour, the Nature Train, and of course, the garden and house themselves. Price: General admission is $20 for adults, $10 for kids ages 6-12, and free for kids 6 and under. Oak Plantation Campground is about 15 minutes south of Magnolia in West Ashley. It’s a gorgeous campground with plenty of shady trees in a park-like setting. They offer full hookups, a pool, outdoor activities, a fishing lake, and a camp store. All sites have Wi-Fi and cable available. Rates start at $45 per night. Since we’re in the Charleston area already, let’s stop by Boone Hall, one of the oldest working plantations in the United States. It’s a Colonial Revival plantation with many of the original slave cabins still on the property. 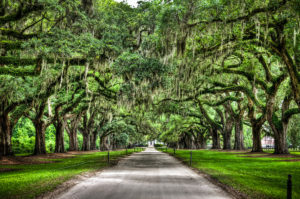 What makes Boone Hall a must-see, though, is The Avenue of Oaks. This grand entrance was a long time in the making; it was originally planted in 1743. Nearly 90 oak trees line the driveway, their branches connecting and making a lush, green canopy overhead. It’s a lovely place to snap a few photos while you cool off under the shady oaks. Price: $24 for adults, $12 for kids ages 6-12, and free for kids 5 and under. Discounts for seniors and military. Mount Pleasant KOA offers convenience, comfort, and fun. They’re located in Mount Pleasant, just minutes from Boone Hall. Amenities include full hookups, Wi-Fi and cable, a swimming pool, fishing, and bike rentals. They have a variety of activities, too, including outdoor sports like volleyball and basketball, a tye-dyeing station, and weekly pancake breakfasts. Rates range from $57 to $79 per night. 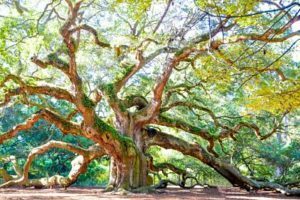 Speaking of oak trees, don’t miss a chance to see South Carolina’s oldest one. At an estimated 500 years old, it’s not just the oldest tree, but the oldest living organism in the state. Standing underneath the Angel Oak can only be described as humbling. Its gnarled branches stretch out to almost 200 feet, and the tree itself stands as tall as a 6-story building. The branches create an enclosure of sorts; some reach upward, while others dip down underground and back up again. It’s by far the best place in the state to stop for a picnic. Unfortunately, you can’t just pull up and camp under the old oak tree – though it would be cool if you could, right? The Campground at James Island County Park is a nice alternative. It’s a picturesque campground with a waterpark, freshwater lakes, fishing creeks, and meadows as far as the eye can see. Amenities include full hookups with free Wi-Fi, a camp store, and more. Rates start at $48 per night. 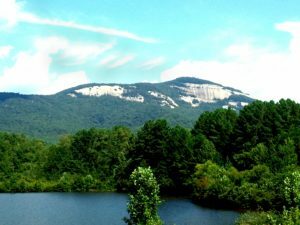 In the northwestern corner of South Carolina sits the state’s tallest mountain, Pinnacle Mountain. Table Rock State Park, which includes the mountain, marks the edge of the Blue Ridge Mountains. Here, you’ll find high peaks, lush forests, and of course, excellent hiking opportunities. There are trails to the summits of both Table Rock and Pinnacle Mountain, each offering a challenging hike with a rewarding view. The park also includes two large lakes, waterfalls, and a swimming hole. Price: $5 for adults, $3 for kids ages 6-15, free for kids 5 and under. Discounts for SC seniors. Campers are welcome to stay right in the park! Table Rock State Park offers 95 basic campsites with water and electric hookups. They offer free Wi-Fi at the visitor’s center. Rates are unlisted, though sites can be reserved online. If you’re in the mood for something upscale, visit our list of the top RV parks in South Carolina. We’ve seen a lot of gardens so far on this trip, but none quite like this one. Pearl Fryar began building his whacky and creative topiary garden back in 1981, using just a handsaw. At the time, he had no gardening skills to speak of, and was understandably surprised when his garden began thriving – most of the plants he used had been tossed aside as compost. 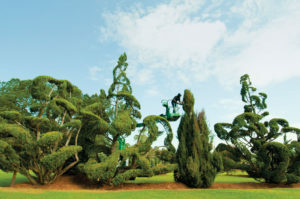 Today, the garden has more than 300 topiaries, interspersed with the occasional “junk art” sculpture. Fryar’s garden continues to garner praise and receive awards, both nationally and locally. Price: Free, but please consider making a donation. Lee State Park is just to the east of Bishopville. It’s a quiet park with roughly 50 sites for RV and tent camping. Sites come with water and electric hookups, as well as a bathhouse with showers on site. According to reviews, rates range from $15 to $20 per night. South Carolina effortlessly merges the old with the new. Sandy beaches line its coast, packed to the brim with modern amenities and attractions. Elsewhere, you’ll find small towns and islands steeped in history and culture. From humid, bog-like marshlands in the east to windswept mountain ranges in the west, there’s an endless array of landscapes to explore. Whether you’re an art aficionado, a history buff, or an outdoor enthusiast, there’s plenty to do and see in the Palmetto State.